There is a Black jobs crisis in America and I see the casualties every day. I see it in the lives of young men such as Andre Hollins and Vincent Loque whose search for work that paid a living wage so that they could sustain their families was dotted with frustration, dead ends, rejections and few opportunities. Both men served time in prison and finding stable work that allowed them to contribute to strengthening their families and their community was a key step in their restoration as returning citizens. Their experience reflects a bitter reality: Black Americans have little power in the workforce. In Los Angeles County, for example, half of all Black people of working age are either unemployed or underemployed, making less than $13 an hour. But Andre and Vincent found another way. Both men used their voice in campaigns and rallies to demand a fair chance at good-paying jobs with benefits and in doing so show how the many, together, can rewrite the rules of an economy rigged by a wealthy few for their own gain. That is why, as the founder of the Los Angeles Black Worker Center, I am taking part in the Worker Voice Summit at the White House on Oct. 7. We know that when people have a say in the workplace, it benefits them, their families and their employers. The White House and the Department of Labor are bringing together working people, labor leaders, advocates, employers, members of Congress and state and local officials and others to highlight the relationship between worker voice and a thriving middle class. It is a necessary step because too many Americans are still being left behind as our economy continues to strengthen. Black Americans, in particular, run up against systemic racism and discrimination that keep them from good jobs. The lack of opportunity has reached a crisis level that destabilizes our families and communities, such as in South Central Los Angeles. As a result, we see extreme levels of mass incarceration and homelessness and deep health and education disparities. The effect of such challenges is particularly harmful to our children because it dehumanizes them and induces the violence that allows police to kill them. At the Black Worker Center, we work to combat these forces by increasing access to quality jobs, reducing employment discrimination and pushing industries through actions and unionization to hire a diverse workforce. For example, we focused on the construction industry in Los Angeles, where less than 3 percent of construction workers are black. When the Los Angeles Metropolitan Transit Agency made plans to build new rail lines and buy new rail cars, we partnered with Metro, unions and other community groups to ensure that the agency and its contractors hired more black workers, as well as people in challenged communities, such as formerly incarcerated people and single mothers. We set up a monitoring system to make the agency and its contractors accountable for their employment choices. Vincent, who was formerly incarcerated, was one of those workers. Today, he works for the Los Angeles-area plant that assembles the rail cars and he is the co-chair of the union committee that, for the first time, is bargaining a contract for the people on the assembly line. Andre, meanwhile, connected with a carpenter apprentice program with the Center's help. With his future more financially stable, Andre was able to get married this summer to the mother of his children. This is the link between a good-paying job and helping our families succeed. So what can President Obama do? The Worker Summit is a good start. It is important to elevate the voices of people standing up for their rights in the workplace. But that is just a first step. President Obama can also take affirmative steps toward ensuring our families don't just survive, but thrive. He can update the executive order that prohibits federal contractors from discriminating by requiring hiring goals based on demographics that show who is underrepresented in the workforce. This would help ensure underrepresented groups, such as Black people and women, have greater access to jobs. Lastly, Obama should designate more federal funds for workforce investment through apprenticeships and training programs, particularly in those communities where racial bias and sustained disinvestment have trapped people's potential. When I go to the White House, I will be speaking about how, together, we can build a strong workplace that benefits everyone. We cannot accept that far too many Americans are still struggling to make ends meet. We've laid out steps that have succeeded in helping working people, fathers such as Andre and Vincent, raise their voice to affect change. We need to continue on that path in order to achieve our goal of creating good, stable jobs for anyone willing to work - jobs that provide benefits and that pay enough to sustain a family. 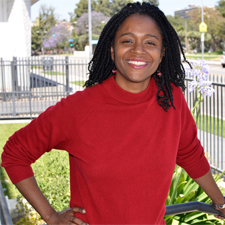 Smallwood Cuevas is the director of the Los Angeles Black Worker Center and the project director of the UCLA Labor Center.